Mike Ullery | Daily Call A farmer drives his combine on US Rt. 36 at Mulberry Grove -Rakestraw Road on Friday. As fall harvest gets in to high gear, motorists are urged to use caution on the roadways as wide and slow-moving farm equipment will be frequent travelers in coming weeks. A farmer drives his combine on US Rt. 36 at Mulberry Grove -Rakestraw Road on Friday. As fall harvest gets in to high gear, motorists are urged to use caution on the roadways as wide and slow-moving farm equipment will be frequent travelers in coming weeks. https://www.dailycall.com/wp-content/uploads/sites/30/2018/09/web1_092118_combine.jpgMike Ullery | Daily Call A farmer drives his combine on US Rt. 36 at Mulberry Grove -Rakestraw Road on Friday. 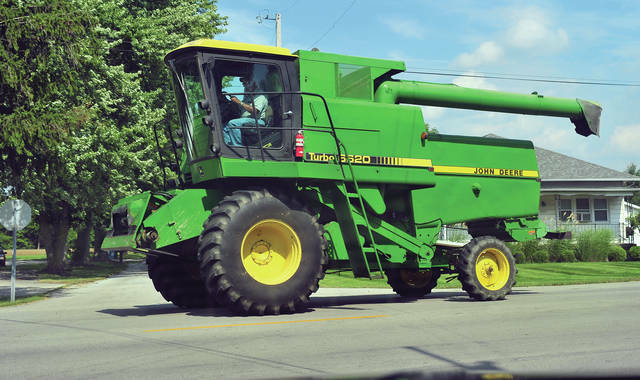 As fall harvest gets in to high gear, motorists are urged to use caution on the roadways as wide and slow-moving farm equipment will be frequent travelers in coming weeks.